With your email, you can login to our site so you can continue purchase what you love! VIP Program: Our monthly membership gives you access to 15% additional discounts on all offers, exclusive private sales, free delivery and more. To see the full list of benefits, visit our VIP page. 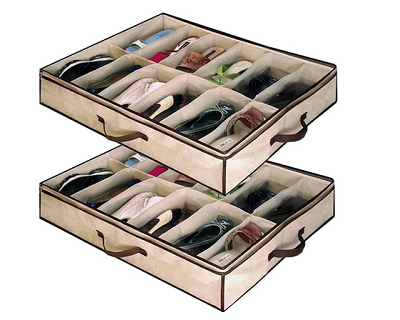 Made of breathable non-woven fabric, these shoe organisers can store and protect up to 12 pairs of shoes. You have previously added to your cart a Flash Deal reserved to our VIP members so you are entitled to the VIP price for this item too! If you wish to continue your purchase as a VIP member, click on "Continue with discounted Price" otherwise, click on "Go to cart" to remove the Flash Deal reserved to our VIP members. You have previously added to your cart an item choosing our VIP Price so you are entitled to the VIP price for this item too! If you wish to continue your purchase as a VIP member, click on "Continue with discounted Prices" otherwise, click on "Pay normal prices"